The traditional home in Westwood Hills at 11200 Homedale St, LA CA 90049 lasted just 2 days on the market before accepting an offer on 7/7/11. This Westwood Hills home was listed as a short sale and needed lien holder approval in order to close. However, it looked to be one of the shorter short sales I have seen with acceptance and close of escrow being just over 3 months. 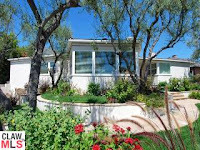 On 10/26/11, 11200 Homedale St closed about $45k over the asking at $1,239,000. According to the MLS, the home is a 3 bedroom / 3.5 bath, 2,776 sq ft home on a 8,370 sq ft lot.